Video clip synopsis – Influential patrons help the bright boy James Cook to an apprenticeship in the merchant navy that would make him a ships’ master. But with an eye for the main chance Cook switches to the Royal Navy. Broadband MP4 cooknavy_bb.mp4 (8.3MB), suitable for iPods and computer downloads. James Cook Joins the Navy is an excerpt from A Likely Lad, the first episode of the 4 x one-hour series _Captain Cook – Obsession and Discovery, produced in 2007. In this excerpt the narrator of the series, Vanessa Collingridge, discusses Cook’s entry into the Royal Navy with Cliff Thornton, President of the Captain Cook Society. At the age of 18 Cook underwent an eight year apprenticeship as a mariner and in 1755 was offered the position of ships’ master by John Walker, to whom he had been apprenticed. Instead Cook chose to join the Royal Navy in the lowest rank of able seaman, a decision that was to have profound consequences for Cook’s career and the history of the world. Cliff Thornton offers two theories as to why Cook chose this path. The first, the accepted historic approach, that with war with France looming, there were excellent opportunities for promotion through the ranks of the Royal Navy. 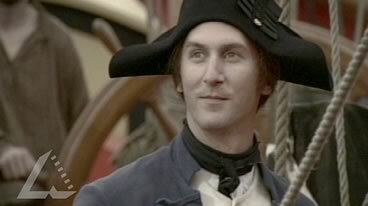 The second, Thornton’s own theory that Cook was encouraged by a local landowner to join the navy and secure land for his father, common practice so that other young men in the area would not be press ganged into the navy. Vanessa Collingridge relates that Cook’s reason for joining the navy was that he “had a mind to try his fortune”. The clip reveals that Cook’s instincts were sound. Within two years he had been promoted to ships’ master. Dr Huw Lewis-Jones from the University of Cambridge and Professor Andrew Lambert of Kings College, London provide an insight into how the Royal Navy at that time used patronage as a way of promotion and how extraordinary it was that Cook advanced himself through the ranks based on his cartographic skill and navigational talent. The series relives what it was like to navigate uncharted and unknown waters in search of a legendary Great Southern Continent and then a North West passage through the Arctic ice; as well as to be among the first Europeans to visit exotic Pacific islands like Tahiti. The harshness and danger of life on the sea is depicted graphically as well as the rigid social structure of the time. The series includes direct descendants of the indigenous peoples of Australia, New Zealand, Canada and Hawaii who Cook met 240 years ago and the men of the Endeavour, Resolution, Adventure and Discovery, particularly the famous gentleman botanist Joseph Banks and the young William Bligh. The young James Cook had two options for his career. Which of these did he choose? What does this tell us about his character and the type of person he was? This video clip examines the reasons why Cook joined the Royal Navy and gives clues as to the way society in the 18th Century was structured. From the video clip, create a table of evidence that points towards the way the society was structured. Make a three column table and label the first column ‘Evidence from the Video Clip’, the second ‘Spoken Evidence’ and the third, ‘What This Tells Us About 18th Century Society’. How did the practice of patronage work in James Cook’s favour? Where do we see evidence of patronage today? Examine the illustrations of the buildings where James Cook was born and then lived as an older boy. What does this tell us about his social background? How does this housing compare to other housing of the mid-nineteenth century? How many different names of landowners can you find? What type of farming seems to be the main type used? What type of employment would be available in a town like this? Report back to the class as a group and discuss which conclusions you think are acceptable and why. Write a short paragraph, using three pieces of evidence, at least one from the video clip, to answer this question: How did the nature of 18th century society influence Cook’s career path? In what ways didn’t it? Use evidence to support your answer.